Saltimbocca is Italian for “jump in the mouth,” and this combination of flavors certainly does. The Chicken Saltimbocca is traditionally made with veal, though chicken is a common substitute. 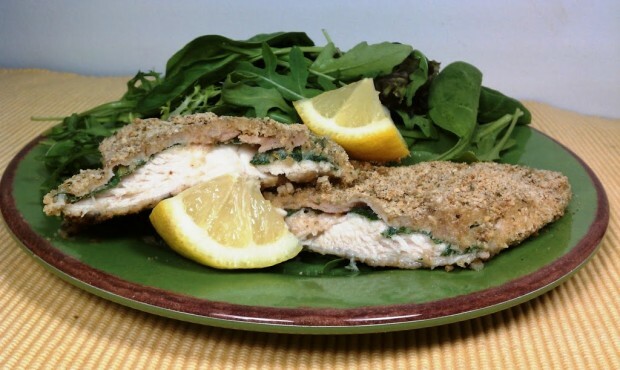 I enjoyed the addition of breading and I think the squeeze of lemon across the top of the meal really brought out the lemony undertones of the sage. 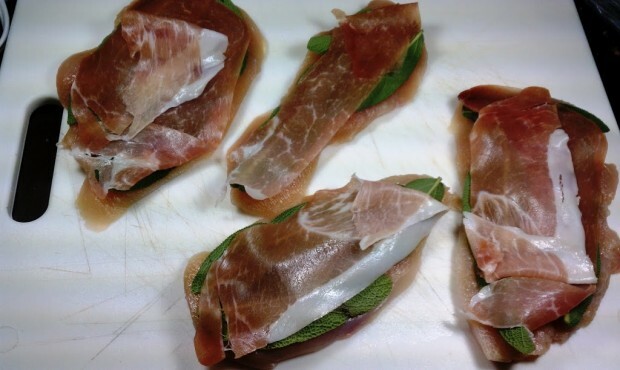 I love the taste of smoky, salty prosciutto and altogether the flavors blended beautifully. This dish looks impressive but is very quick and easy to put together – perfect for a weekday meal! Preheat the oven to 375. Line a baking sheet with parchment paper and set aside. In a shallow bowl, lightly beat the 2 egg whites. Place the bread crumbs on a separate shallow bowl or plate. Set aside. 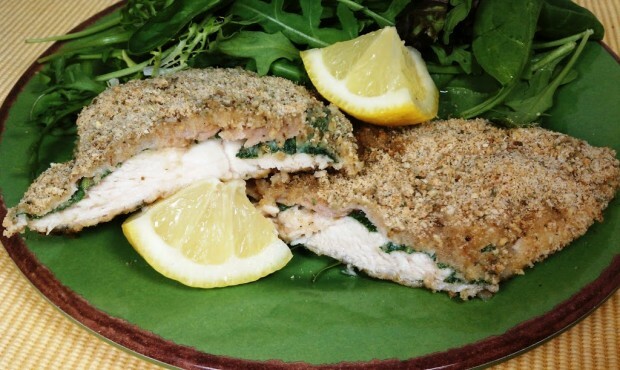 Lay out the four chicken breasts and press four sage leaves into the top of each breast. Lay the slices of prosciutto over the top of the sage. Carefully dip a chicken breast stack into the egg whites, wetting both sides, then coat the breast in bread crumbs. Place on the prepared baking sheet and repeat with the remaining breasts. Press any remaining bread crumbs into the tops of the chicken pieces. Bake about 12 minutes or until chicken is cooked through. Garnish with lemon wedges to squeeze over the top. I kind of made these… I didnt do the breading because I didnt have time, but the actual chicken was WONDERFUL! I wanted to make it so badly, I had to go out and find a side dish to go with it. I end up finding a Risotto Style Pruscuitto Orzo that went FANTASTICLY with this wonderful chicken! Will make again and again.. promise. Ooh, that side dish sounds incredible. Glad you loved this! I made this last night and it was amazing! The flavor combination of the sage and prosciutto was to die for.